Luis Carvalho Costa is an environmental engineer working towards improvements in the natural environment and is based at the Potsdam Institut für Klimafolgenforschung in the research domain Climate Impacts and Vulnerabilities. His research interests include relationships between forest fires and socio-economic, landscape and climatic factors, as well as new approaches to sea-level rise. Annie Cattrell is an artist, a tutor at the Royal College of Art in London and Senior Research fellow in Sculpture at De Montfort University. Her practice has been informed by working with specialists in neuroscience, meteorology, engineering, psychiatry and the history of science and exposed her to wide-ranging, cutting-edge scientific research. Agnes Meyer-Brandis is an artist. Her work engages with science – fact and fiction, fantasy and technology – by way of cloudcore scanners, the migration of moon geese, public meteor watching and much more. Agnes is the founder of the Research Raft for Subterranean Reefology u.V., a small institute that carries out research focused on investigating and studying underground phenomena and forms of life. Ulrika Ferm is an artist and a founding member of the Finnish artist-run initiative Platform, which brings together international artists with local artists and theorists to discuss artistic and environmental issues. Many of her own art projects deal with issues relating to the weather – in Ireland, Berlin and Armenia. Christian de Lutz is an artist and curator from New York. His artworks deal with social, political and cultural themes, with an emphasis on technology, migration and cultural borderlines. Based at Art Laboratory, Berlin, his curatorial work concentrates on the interface of art, science and technology in the 21st century. Regina Rapp is an art historian and curator, as well as Assistant Professor at the Burg Giebichenstein Art Academy Halle. Along with Christian de Lutz she runs Art Laboratory, Berlin, a non-commercial art space established as a platform for inter-disciplinary exhibition projects in an international context. Prof Dr Thomas Schnalke trained as a doctor and gained his Habilitation in the History of Medicine. He is the Director of the Berliner Medizinhistorisches Museum der Charite and has published and organised many exhibitions on the history of medicine as well as curating art exhibitions in medical contexts. Dr Birgit Schneider is a lecturer in Image and Media Theory at the Universität Potsdam where she is also a Dilthey Fellow. Her research ‘Climate Images. A typology of visualization of the climate and its changes since 1800’ is in cooperation with the Potsdam Institut für Klimafolgen- forschung. Dr Thomas Schneider von Deimling is a climate researcher in the Earth System Analysis research domain of the Potsdam Institut für Klimafolgenforschung. He is currently Project leader of the Ufoplan 2012, which focuses upon the size and dynamics of the permafrost-carbon feedback and has also worked on a project which aims at developing new formats for improved communication of climate science to the public. SATELLITE SALON: ATMOSPHERES is brought to you by artists Lucy Powell and Andrea Roe and writer-curator Dr. Sara Barnes. The salon hosts artists, scientists, writers and curators in various venues in Berlin and the UK. We aim to establish stimulating dialogue around changing themes, leading to a productive network of interested individuals with an eye to facilitating art/science collaboration. 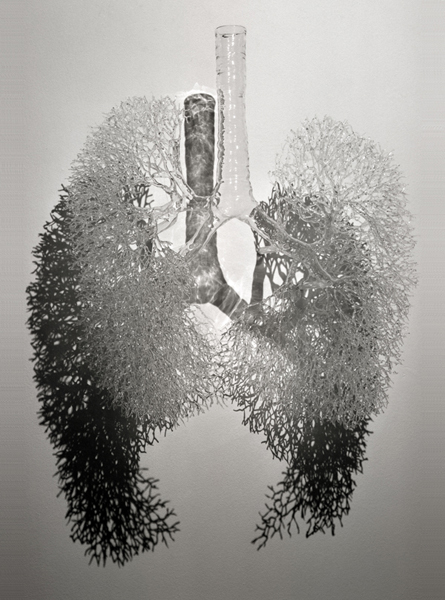 Image: Annie Cattrell, Capacity, glass lungs, three times life size, 2000. Courtesy the artist.